I was struck by the number of attendees wearing VR goggles to experience 3D visualization software. 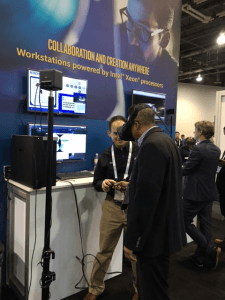 Virtual reality (VR) was the star of the show at Autodesk University 2016, held Nov. 15-17 in Las Vegas. Looking around the show floor, there were many demos offering VR goggles to experience Autodesk visualization software in a 3D, virtual realm. This wouldn’t seem so remarkable if these VR headset wearers were watching animated games designed on Autodesk Maya software, as virtual and augmented reality has been employed in gaming and entertainment for several years. No, these people were experiencing construction and manufacturing simulations in full virtual reality, visualizing Autodesk Revit designs “from the inside” without the need for printed models or schematics to test and inspect building and bridge designs. 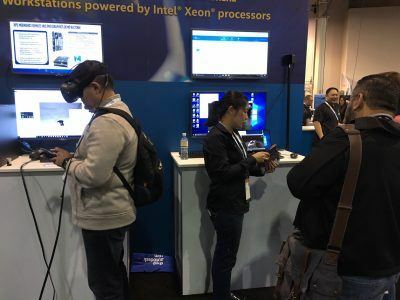 Intel had a large presence at the show as well – Autodesk and Intel work closely together, as the compute-intense workloads associated with cutting-edge 3D design and modeling requires a cost-effective, high-performance processing platform such as those powered by Intel® Xeon® processors. Autodesk offers computer-aided design (CAD), engineering, and digital content-creation applications that are certified for compatibility and optimized for performance on Intel® Xeon® processors. 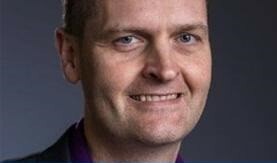 In the opening keynote, Autodesk CTO Jeff Kowalski described a set of new technologies that are transforming the relationship between humans and computers, with the promise to usher in a new age of design, imagination, and creativity. Machine learning, artificial intelligence, generative design, virtual reality and robotic systems are aligning in ways that increasingly allow computers to express creativity and function not just as tools for people, but as an augmentation of human talent. Kowalski staff described how it was already possible in Autodesk LIVE to take Revit architectural models to a VR environment and, using VR headsets, step inside an interactive visualization. For instance, after architects and engineers have designed a hospital building in Revit, the medical staff could experience a virtual reality visualization of the space to test surgery room configurations, spacing of fixtures in exam rooms, and other trials of the design – all without investing in printed models or other mockups. It’s easy to see how virtual reality could greatly streamline construction and manufacturing workflows – and provide huge cost savings by reducing the need to build models and schematics – but the ultimate expression of these technologies will come when we can perform interactive design in 3D virtual reality. That is, when designers can modify designs by interacting with a virtual model in collaboration with others, with changes made in virtual reality reflected in the design files, all in real time. We’re just beginning to grasp the cost and time efficiencies that virtual reality & augmented reality technologies can offer to the construction, design and manufacturing industries. Also appearing in the opening keynote was Anna Nixon, a student at Westview High School in Beaverton, Oregon. Anna was a member of the school’s FIRST (For Inspiration and Recognition of Science and Technology) program, and was part of an Intel-sponsored team that built a robot that shoots basketballs. Sixteen-year-old Anna held her own on a stage dominated by C-suite executives, a real testament to her drive and intelligence: She has even established her own nonprofit to benefit girls learning STEM subjects. 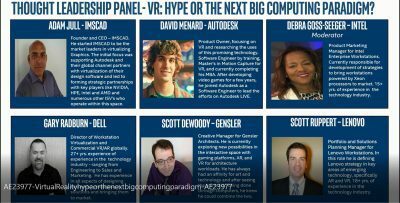 Continuing the VR conversation at Autodesk University, Intel sponsored a panel discussion on Virtual Reality – Hype or the Next Big Computing Paradigm? The panel included representatives from Lenovo, Dell, Autodesk, IMSCAD, Intel and Gensler Architects, and functioned as a thought leadership forum on the topic of emerging enterprise applications for VR and AR. One of the themes that emerged, and that echoed throughout the conference, was that local workstations are still a requirement for most 3D simulation workflows. 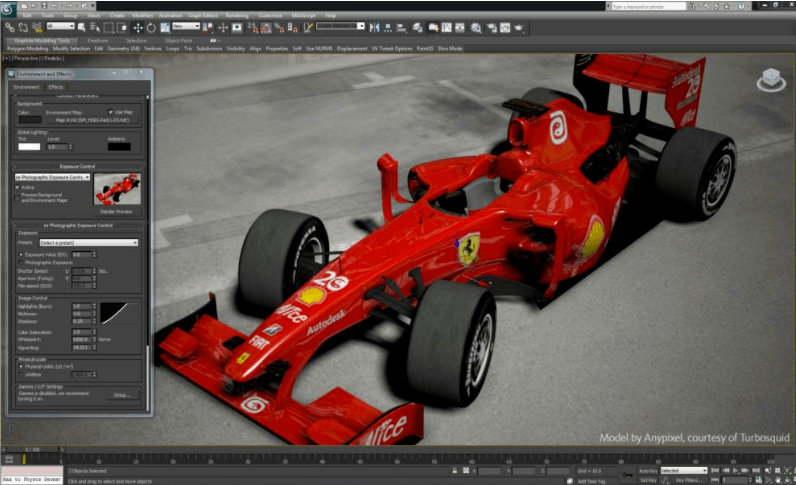 Though most Autodesk software is based in the cloud, you still need local processors to do the rendering due to the intense computational demands of most design workloads. Workstations running Intel Xeon processors can help meet the demands of these compute intensive designs. With graphics capabilities integrated directly on the processor, workstations powered by Intel Xeon processors eliminate the need for (and cost of) a separate video card. Processors that can handle the sheer number-crunching required by graphics-intensive projects—and that support sufficient memory—are also critical. Because you can run simulations on your local workstation as needed, you reduce time spent waiting on renderings and increase your productivity. To learn more about how Intel Xeon processors can help you design faster and more affordable, read this solution brief. After attending Autodesk University 2016, it’s clear that Autodesk is at the forefront of developing new industrial and media use cases for virtual reality, though these compute-hungry workflows also require extremely high performance computing platforms with powerful visual resolution. And that’s where Intel comes in. What were your favorite moments at Autodesk Univeristy 2016? Share your thoughts and be sure to follow me at @TimIntel and #TechTim for the latest news on Intel and Autodesk.